Inkstones are much more than just practical items for ink grinding. There are two main types; one for everyday use and another for decorative or collecting purposes. In ancient China beautifully carved and inscribed inkstones made by famous artists were often presented as tribute or gift from one ruler to another. Some historical inkstones can be extremely valuable, with prices reaching as high as few million USD. Nowadays prices of good quality inkstones range from one to fifty thousand dollars. There are four famous regions in China that are well known for quality inkstones. These are: 1. Duan inkstone (端硯) from Guandong province (広東省) 2. She inkstone (歙硯) from Anhui province (安徽省), 3. Taohe inkstone (洮河硯) from Gansu province (甘粛省) 4. Chengni inkstone (澄泥硯) from Shandong province (山東省) “Duan” inkstones are the best ones available. They are made of volcanic tuff that is richly interwoven with natural markings that are brilliantly utilized by skilled inkstones makers during carving. “She” inkstones are not far off in quality. They are mostly black colour, naturally sprayed with sparkling markings that resemble a night sky painted in bright stars. “Tao” inkstones are made from jade colour stones mined from the bottom of the river Tao. They are very rare and quite pricey. 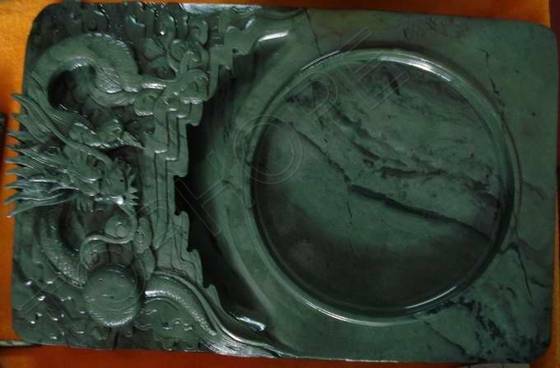 Due to fact that the stone used for their production lay under the water for centuries, if not longer, Tao inkstones have extremely low water absorption ability, which is one of the main features of a good inkstone. “Chengni” inkstones are not carved but crafted. They are mineral based, being made out of filtered silt collected from the Yellow River. Silt is then mixed with other ingredients, formed, dried, inscribed and fired in a kiln. Chengni inkstone not only produces very fine ink but also have great ornamental value. In Japan, out of over 20 regions producing inkstones, few need to be distinguished here. These are: Yamaguchi Prefecture (山口県), Miyagi Prefecture (宮城県), Mie Prefecture (三重県), and Yamanashi Prefecture (山梨県). These four especially manufacture inkstones out of stones mined in Japan. Others use mainly materials imported from China. Regardless of the region or country, stones from various regions have different characteristics, such as hardness, colour, natural patterns, etc. The latter two are often used as an integral part of a beautiful design or carving. Needless to say, it further increases the value of an inkstone.